was the grandson of the famed figure in Japanese cultural history, Sen Rikyū. 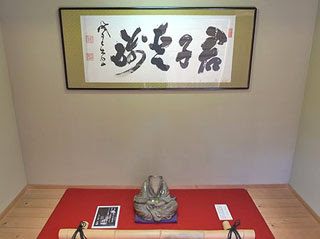 He is remembered as Rikyū's third-generation successor in Kyoto through whose efforts and by whose very being, as the blood-descendant of Rikyū, the ideals and style of Japanese tea ceremony proposed by Rikyū were able to be passed forward by the family. He was the son of Sen Shōan and Okame, a daughter of Rikyū, and is counted as the third generation in the three lines of the Sen family known together as the san-Senke (see Schools of Japanese tea ceremony). He helped to popularize tea in Japan. It was in the generation of his children, Sōsa, Sōshitsu and Sōshu, that the three lines of the family 三千家 -- the Omotesenke, Urasenke and Mushakōjisenke -- were established, with these three sons, respectively, as their heads of house. 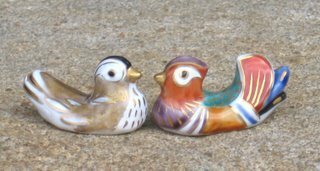 They are counted as the fourth generation in the respective lines. At around the age of ten, he was sent to live at Daitoku-ji temple, through the wish of his grandfather, Rikyū. 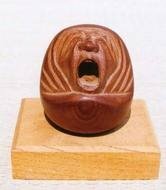 He lived at the sub-temple Sangen'in, under the supervision of the priest Shun'oku Sōen. During the years following Rikyū's death, when the Sen family was disbanded and Sōtan's father found shelter with the daimyō Gamō Ujisato in distant Aizu Wakamatsu, Sōtan was able to stay safely at Daitoku-ji temple. When his father was at last permitted to return to Kyoto and reestablish the Kyoto Sen family, Sōtan left the priesthood and returned to his family. His father soon left the headship of the family to Sōtan, and moved out. A tea ceremony legend that probably dates from the 1st half of the 17c. An old fox, the story goes, lived in the precinct of Shoukokuji 相国寺 in Kyoto. In the autumn he would disguise as himself as the famous tea master Sen Soutan 千宗旦 (1578-1658) and often visit tea masters in neighborhoods to drink tea and eat cakes. 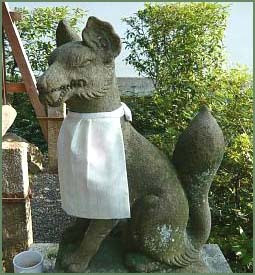 Everyone enjoyed the tea master's company even though all knew he was really a fox. Thus, they called him Soutankitsune. The story demonstrates how well known Soutan was in tea houses at that time. 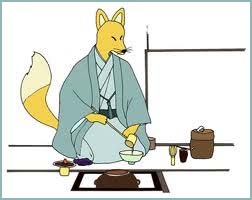 The fox would take on the form of an unsui monk　apprentice and sit with them in Zazen for hours. Sometimes he would play Go with the head priest. Anyway, it was a kind and pious fox. But sometimes he would go to tea masters' homes nearby, prepare tea for himself and eat all the cakes. One day the head priest had asked Sotan to come and perform a tea ceremony for his new tea room at the small hall Jisho-In 慈照院 (Jishooin) in the temple compound. The readl Sotan was late and the fox took over his role. Then the real Sotan showed up late and participated in silence. Afterwards he said he was surprized at the skill of the fox. 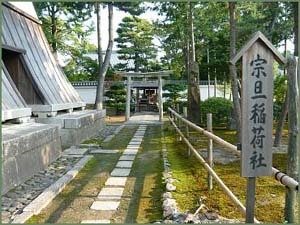 The tea room is called Ishin shitsu 頤神室（いしんしつ）. From the window you can see the stone statue of the fox through an opening said to be made by the fox when he fled the tea room in great haste. The fox once stole some abura-age tofu (a food he liked most) from a nearby tofu store but was found out. The owner chased him, the fox fell into a deep well and that was his end. Another legend says a hunter got him and shot him dead. After his death, people felt sorry for the funny fox who had been rather kind sometimes and so they build this Inari Fox Shrine to honor his memory. 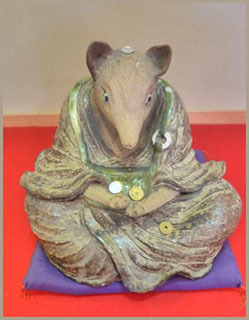 There is also an Inari fox shrine in his honor in the precincts of the temple. People come to pray here not only for improvement in their way of tea, but also for good business and good luck. 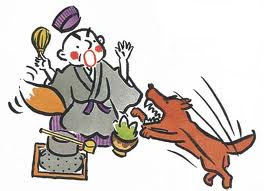 The fox had come here too to perform the tea ceremony and even when they found out it was the fox and not the real tea master, the discipled let him go on and to the ceremony. The fox also went begging with the monks and got enough money to help them from a financial pinch. When he was so eagerly playing Go with the priest, he even forgot to hide properly and his foxtail popped out, but people just grinned and pretended not to see it. One day a burgler got into a tofu dealer in the neighbourhood and stole all his money, so the store was almost bankrupt. Sotan the fox heared the story and decided to help (because he had been steeling abura-age from this store sometimes). He collected many lotus leaves and sold them. Then he used the money to buy soy beans for the tofu dealer and thus helped to revive the shop. Rumors of the fox story of course helped the shop also to sell even more tofu ever after. a tempura from mice (nezumi no tempura 鼠の天ぷら). Aaa, this was a great pinch for the fox, because if he ate this delicacy, he would loose his power to change into a human being. Aaa, what to do? What to do? but alas, he turned into his fox features. A dog nearby, who was usually kind and sleepy, saw the fox and chased him away and whow and behold ... the fox in his haste fell in a deep well and was gone for ever. and our story comes to an end !
. 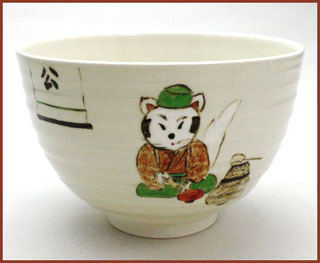 Tea Ceremony Saijiki - 茶道の歳時記 .
. Inari 稲荷 the Sacred Foxes of Japan . 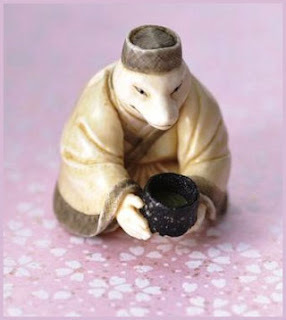 A fox that took the form of Sotan Koji the Tea Master?